This message was published by the Ontario Federation of Labour. Let’s take back Ontario by taking action on April 17 with the Power of Many. The Ford government’s budget on April 11 could mean more cuts to what working people and families depend on like health care, education, public services, decent work, as well as safe and healthy communities. This government’s plan to increase classroom sizes and privatize healthcare have galvanized students, parents, educators, health care workers, and communities right across Ontario to take action. 150,000 students across Ontario walked out to protest cuts to education on April 4th. This past Saturday, over 30,000 rallied in Queen’s Park for education. The resistance to the government’s reckless actions is growing. We know that universal health care, quality public education, and public services are the great equalizers in our society. We are the majority. We have the power of many on our side, and we will use it fight to protect an Ontario for all. On Wednesday, April 17, all day, all across Ontario, we will sound the alarm by talking to the public, co-workers, neighbours, family, and friends about what’s in the budget and about what’s at stake, so they can take action by demanding that the PC government do the right thing and fund public services, not cut them. We’ll be at busy transit stops, busy intersections, bingo halls, local coffee shops, outside workplaces, in workplace lunchrooms, anywhere we can carry our message: protect Ontario and fight for a province for everyone. Ford may have a majority at Queen’s Park, but we are the majority – we are the people! Let’s galvanize that majority to action on April 17. SCROLL DOWN to sign up below for an action near you. Actions are still being scheduled. Find one near you at www.oflevents.ca, or start one by contacting mbayon@ofl.ca. Get ready for the Day of Action by joining a province-wide conference call Monday April 15 at 6:00 p.m. Everyone in Ontario is welcome to join the call. It will provide you with the details of what’s in the budget so you can take that information to the streets on April 17! RSVP and get the call-in details by clicking here. Outreach actions will be planned all over the province. Power of Many regional hubs have scheduled planned actions for the 17th. Please let us know about your action plans so the OFL can promote them widely. 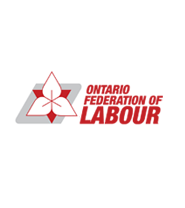 Email information about your action to info@ofl.ca. Include location, time, and a short description. We will make a Facebook event for your action and add your labour council as co-host. Please start promoting the day of action by sharing our event by clicking here and signing up here. We are developing a common flyer for the action on the 17th. In the meantime, please order placards and issues flyers that we already have available by emailing info@ofl.ca. You can check out materials and download them by clicking here. Look out for more actions in London, Waterloo, and more Toronto locations coming up! Visit oflevents.ca for the full listing of events.